Performers of black metal from Oslo; fans make a distinction between their early ('melodic black metal') and later era ('symphonic black metal'); we must admit that we are quite in the dark about the difference. Although Norway and Iceland in our time are geographically separate entities, the two countries do have a thing or two in common: Old Norse for example, the language once used in Scandinavian countries and in areas under their influence. 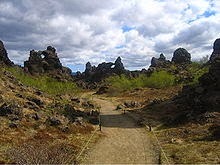 Dimmu Borgir in Icelandic, and also in Old Norse, means something like 'dark fortresses', and it is also the name - written as one word in that case - of a dreary volcanic formation in Iceland.